The Aviva method is a series of exercises that moves the full body and may effectively eliminate complaints caused by a sedentary lifestyle and stress. Aviva is a way to energise your body, improve your productivity and above all, since it focuses on the pelvic area, boost your femininity. It can facilitate the self-healing process in the body and restore the optimal age-appropiate health. The regularly practiced method has proven its effectiveness for decades, it may be a medication-free solution – in some cases add-on treatment to medical treatments – for increased fertility, regular ovulation, regular and painless periods. It may effectively treat symptoms of the menopause and incontinence. The Aviva method can also be a powerful prevention tool. Aviva contributes to preventing the symptoms of the above conditions, therefore we should not wait until a specific condition develops, but start using Aviva before this actually happens. The Aviva method may be as useful over sixty as in young girls with settled cycles and in-between. The exercises of the method are not strenuous, are moderate that are to be carried out precisely. 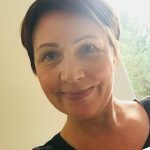 The Aviva method was developed by dancer-physiotherapist Aviva Gabriela Steiner and it reflects more than 25 years of observation, experiencing and practicing. The Aviva method encompasses a sequence of exercises that stimulate and strengthen the inner and outer muscles of the lower abdominal area, increase blood-flow to and within all reproductive organs and strengthen sphincter muscles. By exercising on a regular basis, the respective organs will benefit from a more steady supply of fresh arterial blood, and through it, an increased amount of hormones, nutrients and oxygen. This constitutes a strong stimulus that strengthens and nourishes the muscles and organs of the pelvic region, and supports the self healing ability of the body that may result in the healing of gynaecological problems, a natural hormone balance and an enhanced reproductive health. The Aviva method is not recommended in case of cancer or suspected cancer. The Aviva method is not recommended in case of bleeding fibroids. In case of contraceptive coil the Aviva method can be practiced with regular medical check-up. In case of endometriosis, if the period is irregular and painful due to endometriosis, the practice of the Aviva method is not recommended. After insemination or in-vitro fertilisation (IVF) the Aviva method cannot be used until there is no clarity on the outcome of the intervention. In case of pregnancy, the Aviva method is not recommended during the first three months of the pregnancy. From the 4th month of the pregnancy the prenatal exercises are recommended. HOWEVER , the practice of the Aviva method effectively prepares the pelvic organs for pregnancy, so it is recommended to practice before a desired pregnancy, as well as before a planned insemination or IVF. The exercises within a series should be carried out continuously with no break between them. The method is a moderate-intensity activity. Slow walk or breathing exercises are advised in case a break is needed, before continuing the exercices. Do not practice before going to bed since exercices have a general invigorating effect. Avoid other physical exercices, gymnastics on the day when practicing any of the Aviva method series. Do not forget to drink enough water. Hot drinks and relaxation after exercising improve their efficiency. Exercise carefully if you have pain in your back or hips and always report it. These 18 exercices work through our full body, invigorates and boosts up productivity, may alleviate complaints caused by sedentary lifestyle, hormone imbalance and stress that cause: irregular cycles, cramping or heavy periods, fallopian tube blocage, PCOS, cysts, menopausal symptoms, incontinence. It is also recommended for men to treat the sitting lifestyle caused low sperm count, reduced fertility, potential problems. Duration of the Basic series is 30 minutes, with cheerful background music, that contains some dancing movements. The Basic series is recommended 2-3 times a week, at any time during the cycle, except for the first three days. Hint: Give a good start in the morning to your day, become lively and productive with The 18!!! By these 15 exercises we support the most amazing process that takes place in the female body, the ovulation, that may lead to conceiving of a new life. Duration of this series is 20-30 minutes, with lively background music. This series is recommended to be started after a minimum three month of practice of the Basic series. We practice it from the fourth day of the cycle until day 14 of the cycle, 2-3 times a week, right after the Basic series (on the same day). 11 exercises recommended after a complication-free delivery – as soon as the mother feels it comfortable exercising – and also for older persons. Regenerates muscles and joints. 11 exercices that reduces or eliminates the symptoms of incontinence and uterine prolapse. Strengthens the sphincter muscles, the pelvic muscles and ligaments. The series includes 12 exercices and can be practiced every day. The 12 exercises can be even split in two sets of exercises (e.g, six in the morning and six in the afternoon) . To whom we thank the method and how was it born? Aviva Gabriela Steiner was born in 1930 in Budapest (Hungary), her parents were leading sportsmen, vegetarians and living by the laws of the nature. Aviva grew up practicing gymnastics and swimming, and later became a professional dancer, and also obtained a degree in physical training. Once she left behind her career as a ballerina and actress, she started working as a physical education teacher in Jerusalem. In her free time she attended anatomy and physiotherapy classes at the medical university and practiced yoga. For a decade Aviva was trying to identify and perfectionalise movements that could better control physiological processes in the uterus: menstruation, conception and even birth control. There was an experience that triggered her on her way: in one of her gymnastics classes for elder women aged 45–70 she asked the class to do a certain series of movements (they are known today as the Basic method’s 7th exercise). To her biggest surprise almost only the women closer to 70 showed up for the next class – the rest had their periods! 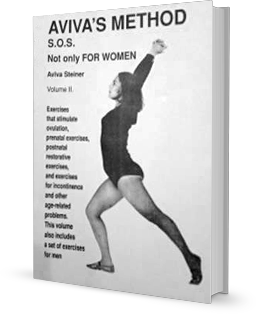 Aviva continued to develop new exercises and observe their effects on the women’s genital system through collecting and recording the feedback from the women she was teaching. Over time, she realized that the movements not only affect natural processes such as menstruation and ovulation but also have healing effects on the most common gynaecological problems such as reduced fertility, cycle irregularity, hormonal imbalance. She is the happiest person when she sees the beautiful and clever children that the women previously deemed infertile were able to conceive naturally by practicing her exercises! Aviva Gabriela Steiner lives in Israel, she is 87 years old. How come the Aviva Method is not more widely known?! Ready to engage? Let me help you! If you are new to the Aviva method you should register for a Basic course. This is where you learn the Basic series, the Panic exercise and the Anytime-anywhere exercise. You will receive a book with the detailed description of exercises as well as the music material, that you can use at home when practising on your own. It is however strongly advised that you join practice classes after completing the Basic course, in order to deepen your knowledge and further memorise the correct movements. 1./Face-to-face Basic course are organised monthly or on demand and held for minimum three participants, booking is required. If you have already attended an Aviva method Basic course before (with me or with any other instructor) you should continue practicing either individually or in a practice class (2-6 participants). Practice classes will help you refreshing the learned exercises and improving your movements. You can let these classes to become weekly experiences. A least 10 practice classes are recommended to learn the exercises so that you can practice yourself independently, without interruption, for music, in your home. Once you participated in a workshop the book will be of great assitance when you practice on your own! You get the book either in hand in the face-to-face workshop or by post by the time of the via skype workshop so that you can add your comments/notes in the book during the workshop that will be very useful later on. The book itself is not enough to learn the exercises correctly. For me, the Aviva does not only mean a cure for symptoms, but a way of preserving my health and helping others to maintain or restore theirs and to kick off the days lively in body, mind and soul.